A total solar eclipse occurred on August 7, 1869. A solar eclipse occurs when the Moon passes between Earth and the Sun, thereby totally or partly obscuring the image of the Sun for a viewer on Earth. A total solar eclipse occurs when the Moon's apparent diameter is larger than the Sun's, blocking all direct sunlight, turning day into darkness. Totality occurs in a narrow path across Earth's surface, with the partial solar eclipse visible over a surrounding region thousands of kilometres wide. It path of totality was visible from eastern Russia, Alaska, across Canada, and the northeastern United States. A partial eclipse occurred across all of North America. In 1869, astronomer and explorer George Davidson made a scientific trip to the Chilkat Valley of Alaska. He told the Chilkat Indians that he was especially anxious to observe a total eclipse of the sun that was predicted to occur the following day, August 7. This prediction was considered to have saved Davidson's expedition from an attack. A photographic expedition was organized by Philadelphia's Henry Morton under the authority of John Huntington Crane Coffin, U.S.N., Superintendent of the American Ephemeris and Nautical Almanac. The expedition observed the eclipse in Iowa at three stations: Burlington, Mount Pleasant, and Ottumwa, under the respective supervisions of Alfred M. Mayer, Henry Morton, and Charles Francis Himes (1838–1918). Observations were also made by meteorology pioneers Cleveland Abbe and General Albert Myer, in Dakota Territory and Virginia, respectively. It is a part of solar Saros 143. 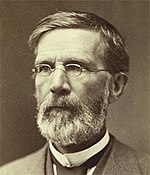 ^ August 7, 1869, Astronomer impresses Indians with eclipse George Davidson, a prominent astronomer and explorer, impresses Alaskan Native Americans with his ability to predict a total solar eclipse. ^ Mayer, Alfred (1869). "An Abstract of Some of the Results of Measurements and Examinations of the Photographs of the Total Solar Eclipse of August 7, 1869". Proceedings of the American Philosophical Society. 11 (81): 204–208. Observatory, United States Naval (1870). Reports on observations of the total eclipse of the sun, August 7, 1869 (Google eBook). Wikimedia Commons has media related to Solar eclipse of 1869 August 7. This page was last edited on 14 July 2018, at 22:53 (UTC).